Researchers Richard Chadwick and Todd Kelly are on a 14-day tour around the Canadian North to install Global Positioning System (GPS) receivers built to map space weather in the Canadian Arctic. 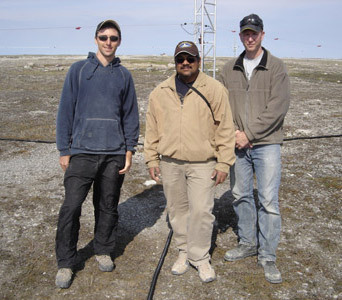 The equipment collects GPS signals from space and transmits it to a climate-controlled server station at the University of New Brunswick in Fredericton as part of the Canadian High Arctic Ionospheric Network (CHAIN)—a research project designed to help scientists better understand planetary environments. Once the data is processed and mapped by UNB researchers and scientists, it is made available to clients across the globe - including the Department of National Defense. To arrange a media interview, please contact Dr. Jayachandran Thayyil.